AverageBro: Eff' Joe The Plumber! How Bout' DeQuan The WeedMan?!? Eff' Joe The Plumber! How Bout' DeQuan The WeedMan?!? What a wonderful country America is. You can have an inconsequential photo-op with a Presidential candidate, and merely a week later, become an overnight celeb upon whose endorsement the balance of the political campaign is weighing. On our live debate chat the other night, errybody was goin' nuts about Joe Wurzelbacher, aka: Joe The Plumber. How some d-bag from suburban Ohio manages to warrant not 1, not 2, not 12, but a whopping 25 (!!!) mentions (21 by McCain) during a Presidential debate is beyond me. So, of course the MSM put out an APB for this cat first thing yesterday morning. And Joe, who is allegedly a plumber, was more than happy to oblige, holding court for all the cable news talkers in front of his home. Silly me, I figured a hard-working, blue-collar, middle-classed, all-American cat like this would actually have something better to do. Like, uhmm, I dunno, work! Nope, Joe knows his 12 minutes of fame are already half used, and this cat was gonna milk it for all the attention he could. Dude has only been on the stump one day, and he's already done more press conferences than Sarah Palin. I just have one question: who died and made this Michael Chiklis-wannabe King Of All Whites? And since we're on the topic, how come Joe Sixpack/Joe The Plumber/Average Joe gets all the damn attention? How about Joe The Morbidly Obese Rapper? Or Joe, the has-been, washed-up R&B sanga? Or Joe, the sharpshooting ATL guard, whom I'm including only to amuse Ciara? Seriously, why the hell should I care about Joe The Plumber and Joe The Plumber only? Why aren't politicians talking about DeQuan The WeedMan? I can't relate to him either, but would it hurt the candidates to pander just a wee bit? DeQuan cares about the issues too. It was another big day for Joe Wurzelbacher on the presidential campaign trail as he received mostly welcome—but some unwelcome–attention. John McCain and his running mate, Alaska Gov. 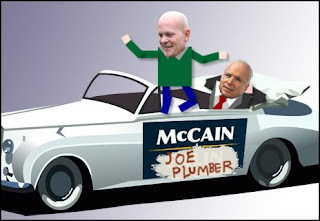 Sarah Palin, both invoked “Joe the Plumber” today at their respective rallies, a day after McCain made him a star during Wednesday’s presidential debate. A few people at the McCain event even tried to get a “Joe, Joe, Joe” chant going. The McCain campaign also released a Web video showcasing footage from Barack Obama’s campaign stop on Sunday where Wurzelbacher complained that Obama’s tax plan could hurt him. But things weren’t all sunny for Joe as the national press began digging into the details of his life. It turns out he owes taxes to the state of Ohio amounting to $1,182.98. He’s not licensed as a plumber and has been working without one. Not to mention, his name’s not even Joe! (Full name: Samuel Joseph Wurzelbacher.) His name is apparently misspelled on the Lucas County Board of Elections database, which raised questions over whether he may be disqualified to vote in November anyway. Further, even if he buys the plumbing company as he wants to do, he still wouldn’t earn anywhere near enough money to face a tax hike under the Obama plan. In fact, he’d qualify for a variety of tax cuts. Joe Wurzelbacher is apparently related to Robert Wurzelbacher. Who is the son-in-law of (are you ready...?) Charles Keating! Anyway, back to Robert Wurzelbacher, Joe the Plumber's father. You see, Robert Wurzelbacher was an executive of American Continental Corporation, the parent company of Charles Keating's Lincoln Savings. That's the bank which caused citizens to lose their life savings and cost U.S. taxpayers $3.4 billion. As part of that scandal, Robert Wurzelbacher pleaded guilty to three counts of misapplying $14 million and served 40 months in prison. Joe, Joseph, or whatever the hell your name is, you are officially outted. Don't you have a leaky faucet or something to fix? Get lost, loser. Enjoy your remaining 4 minutes. Question: Other than the sheer voting numbers that such a mythical character theoretically represents, why are American politicians so obsessed with Joe The Plumber? Is it fair that DeQuan The WeedMan doesn't get the same level of pandering, or does DeQuan eliminate his panderability by always voting Democrat?